Chewing sugar-free gum promotes dental health, but it offers just a few benefits if you have recently brushed your teeth. The increased use of artificial sweeteners such as sorbitol has helped gum transition from a candy to a useful dental tool. Unlike sugar, artificial sweeteners do not contribute to tooth decay. The American Dental Association Council on Scientific Affairs even provides a seal of approval to certain brands of sugar free gum that safely and effectively protect dental enamel and reduce cavities. The ADA recommends that you brush your teeth twice daily with fluoride toothpaste. Between brushing, you should floss regularly and use an antibacterial mouth rinse. Chewing gum proves most useful between the time you brush your teeth. The ADA advises that you chew sugarless gum for 20 minutes after a meal to help neutralize acids that remain in your mouth from the foods you eat. Chewing gum after brushing does help reduce the amount of plaque in your mouth, but not as much as mouthwash, according to an article published in the October-December 2010 issue of "Contemporary Clinical Dentistry." In the article, researchers discuss the results of a study analyzing the plaque reduction benefits of xylitol-sweetened sugar-free chewing gum, mouthwash and Manuka honey, a New Zealand variety. Both the honey and mouthwash reduced plaque in study subjects more effectively than the gum. If you suffer from dry mouth, chewing gum after you brush will help you produce more saliva. Dry mouth, or xerostomia, is a symptom, not a disease and can be caused by medication, diabetes or cancer treatments. Sometimes dry mouth can be more than just a nuisance. It can cause bad breath, a yeast infection in your mouth or other health problems. Increasing the flow of saliva in your mouth helps prevent those issues. Your saliva is so powerful, it can even repair early tooth decay. 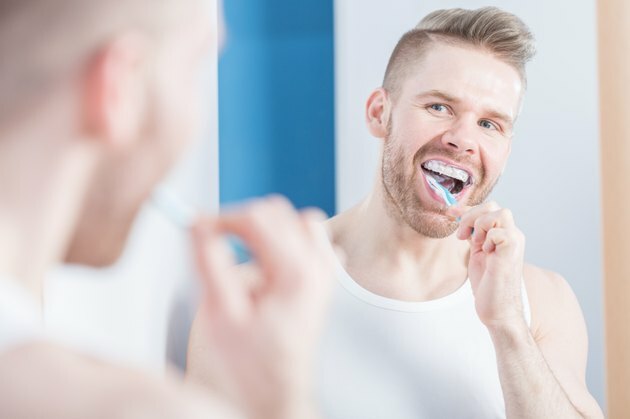 Your overall health might benefit by incorporating xylitol-sweetened chewing gum into your regular dental hygiene, according to a February 2006 article published in the "Journal of the American Dental Association." In the article, researchers note that xylitol reduces the level of cancer-causing organisms in your mouth as well as certain types of bacteria, such as streptococcus. Can Brushing Teeth With Baking Soda and Peroxide Kill Germs That Cause Cavities? Does Chewing Gum Suppress Your Appetite?